Yes, it’s the week of Shamrock Shakes, green beer, kilt lifting and (for the rest of us) a nice pint of Guinness and music that is off the hook! Pre-dating St. Pat is the indigenous tradition of Celtic tattooing, so what better time than now to peruse some Celtic art and history? 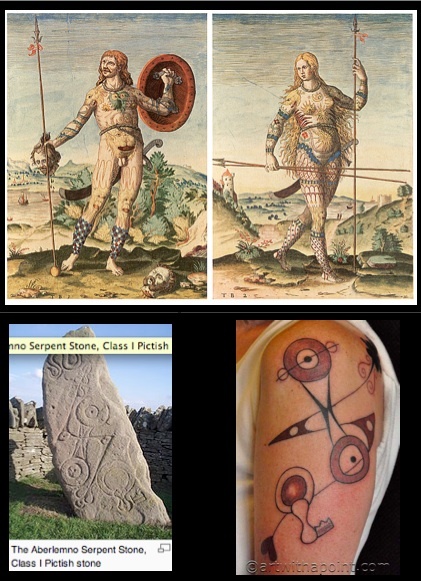 The ancient pre-Celtic people are referred to as Picts, whose name was a derogatory reference meaning “Painted” used by the Romans for their tattooed enemies. The Gaelic Celts used the term “Curithnii”, meaning “the People of the Designs”… and hey now – I’d say that’s more like it. The Picts were not simply painted but indeed tattooed, using sharp iron tools and a natural plant-based blue ink called Woad. While not much is definitively known about the Picts (who began to merge with the Gaelic people by the 10th Century), there are Roman accounts of fierce warriors with “wild hair” (apparently lime paste was used to stand hair straight on end) who were “painted blue”. So, for some of us not much has changed I guess. Here are a few images of how the Picts may have appeared, and a piece of Pictish stone art that I recently had the opportunity to render!